Student Seth Hughes with former Barnsley College Chair of Governors Frank Johnston. Public Services students were acknowledged for their outstanding achievements at a celebratory awards ceremony. Students were presented awards for Special Recognition, Public Services Student of the Year and the Johnston Award for Outstanding Achievement. Award winners at the ceremony included: Mark Wilkinson, Nathan Daley, Ryan Brooke, Corey Holden, Kieran Whilehurst, Chloe Platts and Devan McCutcheon. 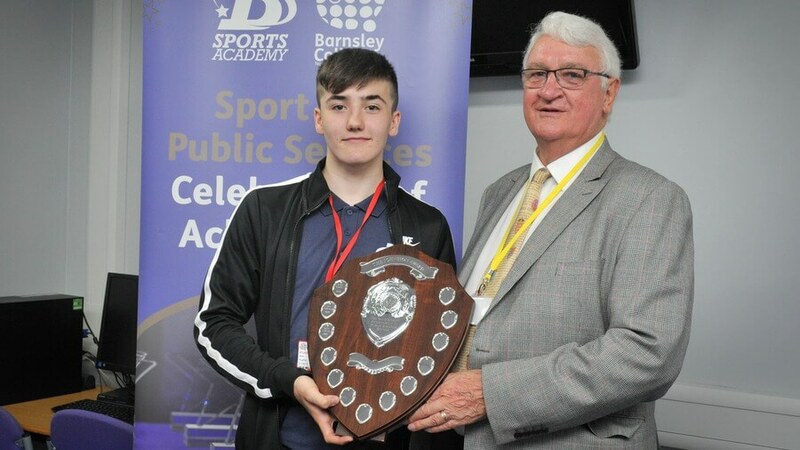 The prestigious Johnston Award, sponsored by former Barnsley College Chair of Governors Frank Johnson, was presented to Seth Hughes, 18, from Birdwell. Seth, a Public Services Level 3 student, impressed Mr Johnston with his dedication and enthusiasm for the course and his ambitions for a career in the Royal Navy. He gave an inspirational speech about careers within the Public Services and encouraged the students to be proud of their roots at Barnsley College.